Montpellier Gardens lie close to the town centre and are an important part of Cheltenham's regency landscape. Many of the buildings surrounding the gardens are listed grade one. The site has been owned by the borough council since 1893 and is part of the Cheltenham Central Conservation Area which, at over 600 hectares, is one of the largest in the country. The gardens can be broadly split into two recreational zones. You'll find most of the park facilities in the southern section, including toilets, cafe, tennis courts and a toddlers' play area. The larger informal northern section is used for promenading, sitting, and informal children's play. In the north-western corner of the park there's a small aboretum where you'll find some interesting and unusual trees. 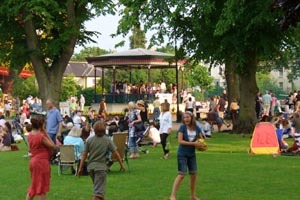 The bandstand on the broadwalk has regular concerts during the summer months. Montpellier Gardens is located on a number of main bus routes into Cheltenham. Stagecoach bus routes run along Montpellier Walk, which has the two formal entrances. The gardens have two formal entrances on Montpellier Walk. The gardens are also accessible from Montpellier Spa Road and Montpellier Terrace. No car parking facilities are available within the gardens,but onstreet parking available on the surrounding roads.